Though it's obvious Roseanne Barr's future "relevancy" as a public figure hinges on the ability to shock, her ongoing rant-fests sadly appear genuine. That doesn't mean her message is particularly coherent. During the most recent edition of public radio's Smiley & West show, a rambling Barr slimed Mitt Romney as a "race-baiter" without a shred of evidence to back up the attack. Of course, Tavis Smiley and Dr Cornel West could have pressed her for details, but didn't. Roseanne believes Romney "has figured out how to divide America" but doesn't seem to grasp how his opponent mastered this concept long ago. 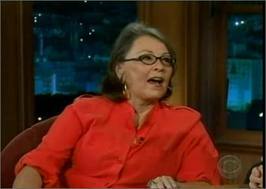 ROSEANNE BARR (34:35): Race is what’s really going to determine this next election. Romney is a race-baiter and I mean I really wanna say that. Romney and people money has figured out how to like totally divide people in America on that issue cause you know that helps money to keep people divided so that they you know go against their neighbors, their brothers so that there’s as close to civil war in this country as there is in every other country where the United States has gone. We'd suggest she stick to growing macadamia nuts, but what are the odds she'd listen?